Having muffler problems can be both dangerous and very irritating. What’s worst is that sometimes a car owner doesn’t even realize they need to get their muffler replaced. But their neighbors do, trust me. 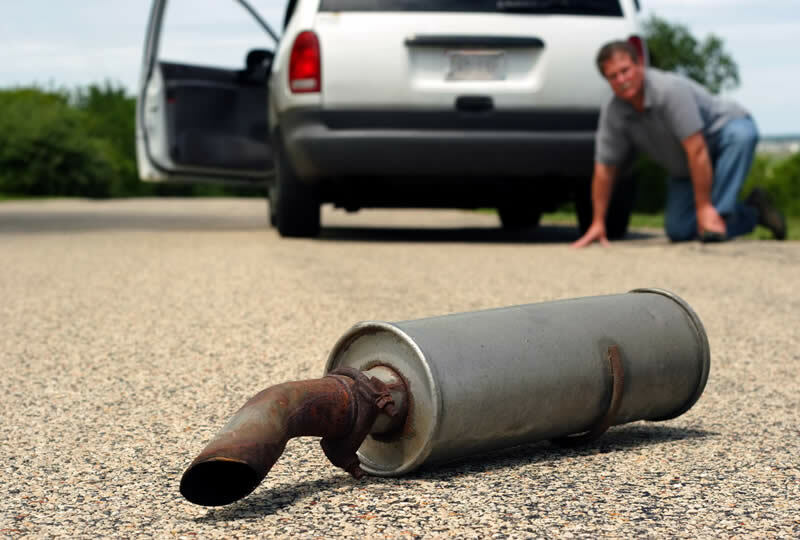 If you haven’t really listened to your car lately then it’s time to put down the window and find out if you need muffler repair in Downriver Michigan. The reason why most people don’t really know they need muffler repair is because the problem didn’t occur at one. Had the muffler fell off down the road and a drastic change in the tone of the car happened then it would be easy to tell. But many times a muffler will start to leak exhaust gases before it fails. These leaks can be caused by many things but are most commonly because of rust on the muffler. Once a muffler starts to rust out it’s only a matter of time before it fails completely. During this process the holes in the muffler will get larger and larger. And the car itself will get louder and louder. This may happen over some weeks or even months. Many car owners don’t even realize it’s happening until it reaches a critical point. Usually when you have your car serviced the technician will look at the underside of the car and inspect the muffler. However, it’s best to ask them if the muffler and pipes looked okay and secure. Since almost all mufflers are located at the back of the car some mechanics will not even inspect them. A small tip can sometimes help them go the extra mile however. If there is a problem the technician can let you know and you can get the muffler repaired or replaced along with any other exhaust pipes. Getting muffler repair in Downriver Michigan is a must if you want to stay legal as well. If there is a problem with your muffler you’ll need to get it repaired as soon as possible. There are several reasons and they all have to do with safety. The first is the fact that the muffler that is bad will allow exhaust fumes underneath the car. These exhaust fumes contain carbon monoxide and if you inhale too much it can kill you. Sitting in your car with the windows down is very dangerous. Also if your car has any sort of air leaks or ways for the carbon monoxide to get into the car from a broken pipe or bad muffler you can be in real danger even driving down the road. If your muffler is leaking these toxic fumes underneath the car be sure to get your muffler replaced and repairs made quickly. The second safety issue with a bad muffler is that it may fall off your car. When a muffler starts to rust usually the brackets and mounting hardware will rust also. These will eventually fail and the muffler may simply fall off after hitting a bump on the road or something. If there are vehicles behind you this can be dangerous for them. That’s why it’s so important to get your muffler repaired when there is a problem.